It looks like Kelly Khumalo and Sketchy Bongo could be working on summer's next big hit! Popular Durban producer Sketchy Bongo has revealed that he is working in studio with singer Kelly Khumalo. 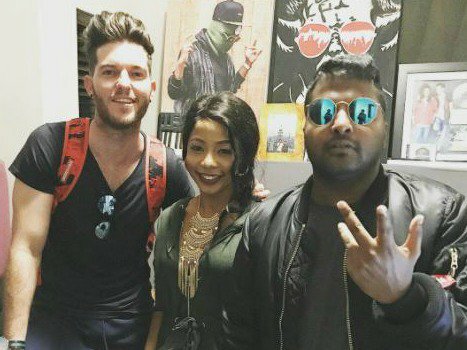 He shared a picture of himself posing with Kelly and Kyle Deutsch in studio on Instagram. While Sketchy is yet to reveal what project the trio is working on, the trio could possible be working on summer's next big hit. When Kelly praised him for being "one amazing producer" in the comments section, Sketchy replied: "Thank you so much. We got a hit on our hands." The producer has worked with the likes of AKA, Danny K, Locnville, Nasty C, Da Les, Jimmy Nevis, and Aewon Wolf in the past. He is also responsible for Kyle and Shekhinah's SAMA-nominated hit, 'Back to the Beach', which became a major summer anthem for Durbanites. We can't wait to hear what Sketchy Bongo has up his sleeve! Another Sketchy Bongo hit is climbing up the charts on the Coca-Cola Top 40. His collaboration with Kaien Cruz, 'Love Me in the Dark', is currently at number 31. Carol Ofori and Ricky take you through 40 of the planet’s hottest songs in our weekly chart show, the Coca-Cola Top 40, on Saturdays from 10am to 2pm. This is the chart for 3 June 2017.